When first presented with the news of a recent diagnosis to a friend, co-worker, or loved one, the initial reaction can be a little overwhelming, and it's difficult to know where to start. We're here to guide you through the process of learning what you need to know to better understand the disease, finding resources and treatment options, and discovering how to offer the best support. If at any time you'd like to speak with someone here at Komen Greater NYC about how to cope with the diagnosis of a loved one, please don't hesitate to contact us. 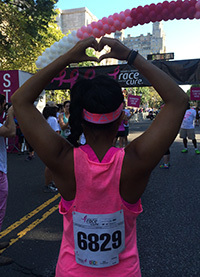 We offer an introductory guide to breast cancer right here on the Komen Greater NYC website. If you're still looking for more information, please visit Understanding Breast Cancer on Komen National's website. Sometimes it's difficult to know exactly what to say, even with the best of intentions. What can I do? What can I say? is a great resource loaded with fact sheets, feedback from surviors and co-survivors, and great ideas for how to contribute with actions instead of words. Expending your time and energy as a co-survivor for your loved one isn't easy, and though you may not realize it now, you need support too. Friends and Family on Komen National's website is a great resource for connecting with other co-surviors, learning how to maintain positive energy, and how to cope with stress, sadness, and other feelings you may be experiencing.